Active found that kids are more likely to be interested in sports if their parents enjoy participating at the adult level. That’s not the only way young athletes see their parents as role models. Kids also keep a keen eye on their parents during youth sporting events. If you yell on the sidelines at the kids, lambast coaching decisions, or challenge the referees, your young athletes will likely behave the same way. Do you really want your sports kids to yell at, challenge and harass coaches, other kids and refs? If young athletes funnel their attention into being angry or upset about what’s happening around them, they’ll be distracted. It will be difficult for them to focus on the tasks needed to get their job done as athletes. And that will undermine their performance. As we’ve said many times before, kids who are distracted don’t play well. You, as parents, can really make a difference if you can behave in a way that allows them to focus. So, how should you behave on the sidelines? Cheer for all the kids. At Kids’ Sports Psychology, we just posted a new article about how parents can best support their kids on the sidelines…a hot topic these days, given the tendency for fighting, yelling, and violence on the sidelines. We’ve got loads of other resources for parents interested in being the best sports parents possible and ensuring their young athletes make the most of their potential. 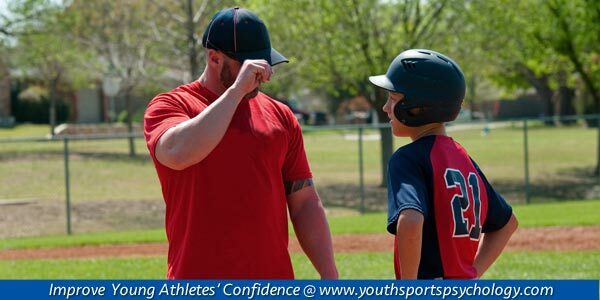 Help your young athletes build their confidence and enjoy sports! Become a Member of Kids’ Sports Psychology – Sport Parent eBooks, articles, and interviews! Help Your Young Athletes Improve Focus In Sports! Are your young athletes easily distracted by people shouting on the sidelines? Do they obsess over their mistakes? Do they worry about what people think of them? These issues will cause their concentration and performance to suffer! The Focused Sports Kid helps kids overcome distractions that can hurt their performance in sports. This is a 7-day program for sports parents and kids to discover secrets to helping young athletes improve focus and concentration! The Focused Sports Kid program is actually two programs: one for sports parents/coaches that provides mental game tips especially designed for parents and coaches, and for young athletes, ages 8 to 12, that will walk them through 7 simple lessons in mental focus in sports. I refereed a soccer match today that was U11G DIV II and there was a dad that was yelling at his daughter. She turned around, in tears, saying “I tried”. I went to her and told her to listen to her coach and ignore her parents since it is interupting her game and mental focus. She was upset and dad didn’t help. I ignore parents as a sports official or even as a spectator. When you bring your 10 year old daughter to tears something has to register. They are still very underdeveloped and still very much learning the basics of sports at that age. I have seen many players lose focus because mom and dad are screaming orders and degrading their child for a mistake. It is a pet peeve of mine as an official. So if I see an athlete being bothered by this I try to talk to them and encourage them to stay focused on the task at hand. I am also a coach and a ref and umpire, and it is even worse when the offensive parent is the coach. I have seen too many times when young athletes are driven from the game by their over zealous parents and coaches. One line I love to use when the parent gallery is begining to take it too seriously is to walk over and comment “You folks really shouldn’t be betting that much money on these games” and most laugh or smile and get the hint. The other comment on this is too many times the parents follow the coach’s lead. If the coach is baggering the kids and the officials the parents usually follow suit. I truly believe the coach needs to run interference for their players even when it is a parent or guardian and that should be one of the preseason contract with the adults.